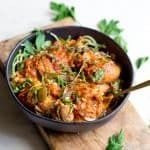 This is the ultimate comfort food healthy dish!! 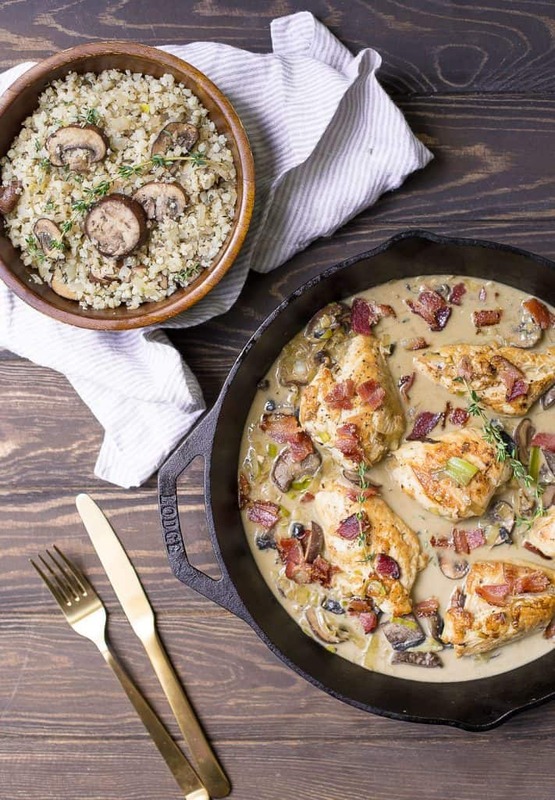 A creamy mushroom sauce with skillet chicken, crispy bacon, and plated on top a Cauliflower Rice Mushroom Risotto. This recipe can be made fast for a healthy weeknight meal, but also is elegant enough to serve to guests! OMGEEEEEE. You guys are going to love this dish! 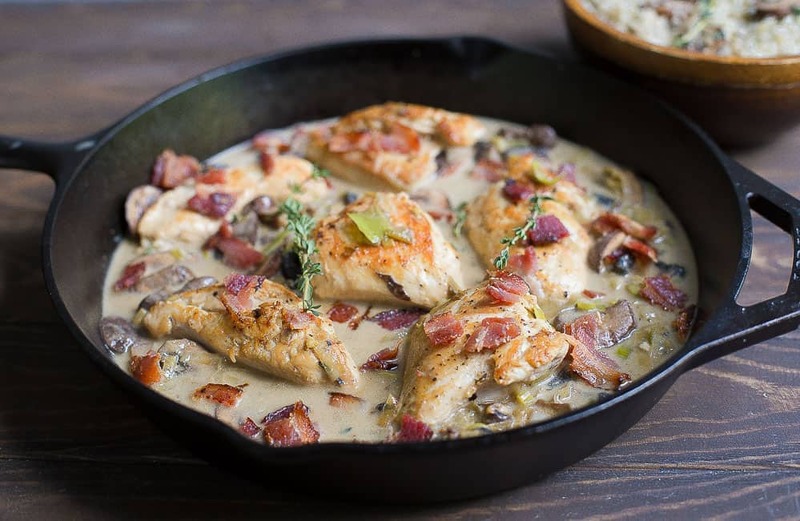 I finally took one of my personal favorite dinners and reader favorites, Creamy Maple Dijon Chicken with Bacon, and made it into a Whole30 friendly dinner. My goodness…. it is pure perfection. 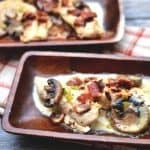 Bacon is cooked to crisp, followed by pan seared chicken, then the addition of mushrooms and leeks. 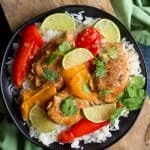 Just like the original recipe, the creamy portion comes from full fat coconut milk (no coconut taste), and dijon mustard. I then served on top a bed of cauliflower rice “risotto”. I mean, if there was ever a dinner you would love to eat every day, this would be it! 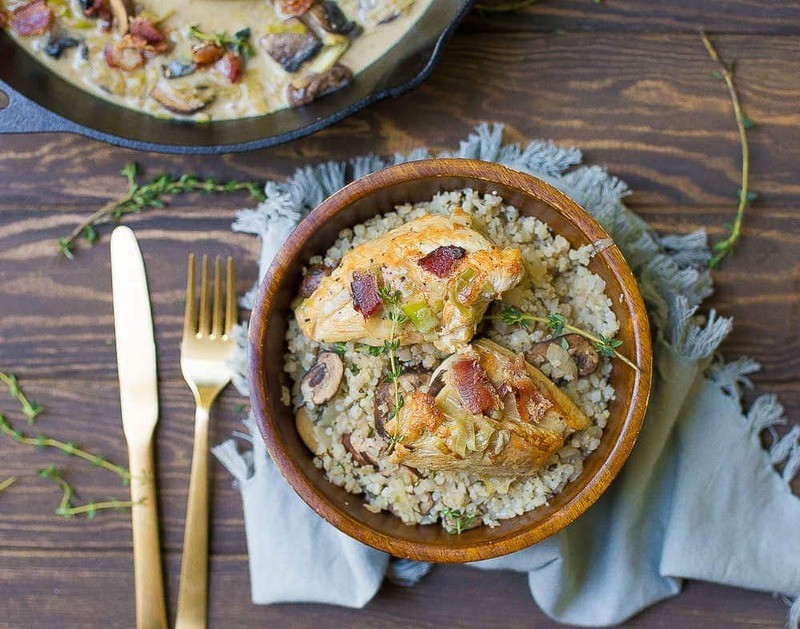 The risotto is topped with some fresh thyme, and mixed with other dried herbs for bold flavor. Add some extra sauce to your risotto to make it nice and creamy, and your belly will be so happy. I’m so glad this ridiculously tasty dinner can be enjoyed by my Whole30 peeps. 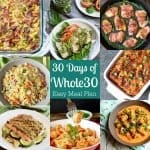 With dinners as tasty as this, who wouldn’t love Whole30? I also love that I can throw this meal together pretty quickly on a weeknight. These easy meals have been a lifesaver for me during our busy fall season. 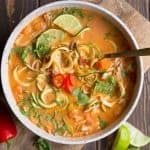 My kids have been in school for a few weeks, we just started our fall activities schedule, and I still need to find time to get a healthy dinner on the table! For a shortcut in this recipe, you can buy pre-made cauliflower rice. 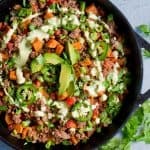 Trader Joe’s makes an organic cauliflower rice that works perfectly in this dish! Start by prepping the risotto. Cut the cauliflower into florets, and place inside a food processor (may need a few batches). Pulse until cauliflower resembles a rice like texture. Begin by heating a large skillet to medium heat. Place bacon inside the pan, cook 4-5 minutes per side (or until desired level of crispiness). Set aside. Reserve bacon fat. Add chicken to the skillet, season with salt and pepper. Cook 3-5 minutes per side (depending on thickness of chicken), and remove chicken from pan (it won't be cooked all the way through). Keep the pan and burner hot. Add additional oil to pan if it's dry. Now toss leeks and mushrooms into the skillet. Saute for 5-6 minutes, or until mushrooms are fragrant and leeks are softened. Crumble bacon into small pieces and return to the pan with mushrooms. Add chicken and coconut milk, stir to combine. Now add dijon mustard. Simmer at medium low heat for 8-10 minutes. Meanwhile, make the risotto. Heat up a separate skillet to medium high heat, add oil once hot. Toss in onion, saute for a 2-3 minutes. Then add garlic and mushrooms. Cook for another 5-6 minutes, until mushrooms are browned. Now toss in cauliflower rice, chicken broth, and dried basil. Reduce heat to low, and let simmer for 8-10 minutes while the rice absorbs the broth. Add salt to taste and top with fresh thyme. 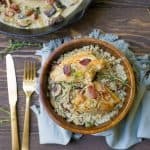 Serve chicken with sauce on top of risotto. This was amaaaaazing!! 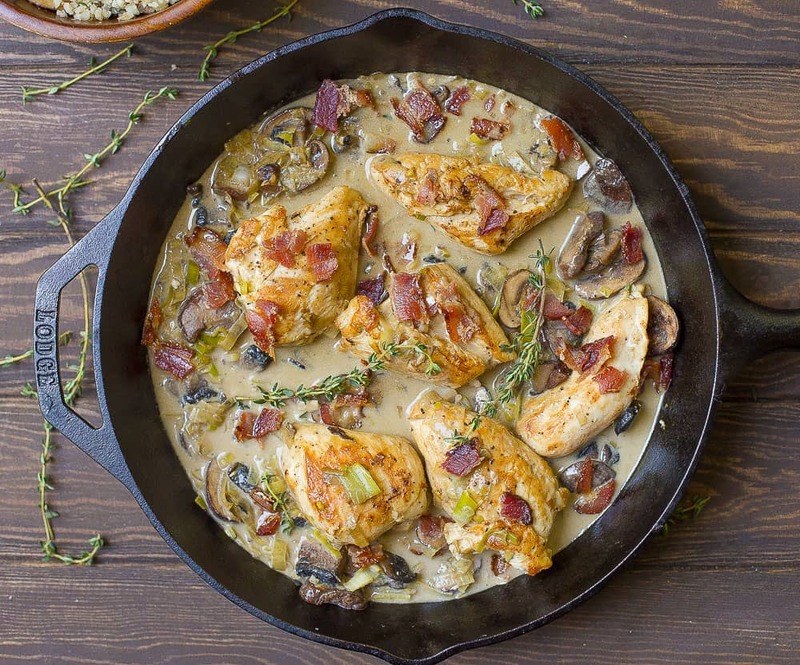 My whole family loved it – full of flavor and great creaminess! 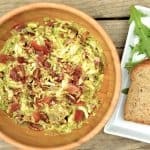 A definite go-to recipe! Thanks, Tobi!!! So glad you loved it! Hello! I’m so excited to find your site. I’ve found multiple recipes I’m dying to try. I might have missed this info, but I have a quick question…is one 12 oz. package of riced cauliflower equal to one large head of cauliflower? Yes, 12 oz is the right amount! I meant to put that in the notes, I’ll be sure to fix. Glad you stopped by and hope you love all the recipes! This sounds so good! I am going to try making it this week. I do have a couple of questions…is there a reason to use avocado or coconut oil instead of olive oil? I wasn’t sure if it would change the flavor profile. And do you have the nutrition info on this? Thank you!! Hi Keely, I prefer avocado oil because it has a higher smoke point than olive oil, and it has a neutral taste. I am not a fan of olive oil taste, but you could definitely use it here! I do not have the nutrition info for this recipe. Your recipe says to reserve the bacon fat. Does it get used somewhere in this recipe. Did I miss it? Hi Amy, making this tonight. Just wondering- you said to reserve the bacon fat but I don’t see specifically what we are reserving it for. Are we supposed to cook the chicken in it and let it flavor the rest of the ingredients sautéed in that pan? Thanks! Hi Emily! Yes, you are to use the bacon fat to cook the chicken. Hope that clears things up. Made this tonight. I used a whole head of cauliflower, and I think it was too much. Maybe it was just a big head, I don’t know. We very much liked the dish though. We’ve been on the Whole30 plan for about 10 days, and the coconut flavor is getting old. Haha. This had a coconut flavor. It must have been from the full fat, canned, coconut milk. I don’t know where else it could come from. We used the bacon fat and Ghee for the cauliflower mix. We’ll definitely make this again. Thank you! This was so good! I am on AIP and this felt like I was cheating! I will definitely make this again. This is AMAZING! Best paleo meal I have made. I’m curious about the nutritional information for this recipe: serving size, calorie count & sugar count. It’s delicious – thanks! Hi Shelby! I just updated the recipe with nutrition facts. You can find them in the Notes section of the recipe card. Glad you loved it!